Carl Talbott knew his house was drafty, but he was blown away by the evidence: wind, like a hair dryer set on high cool, was rushing down his attic steps during a recent energy audit. A fan attached to an airtight cover over the front door pulled a strong breeze up from the basement, too. “No wonder my gas bill has been killing me,” Mr. Talbott said afterward, sitting on the stairs to the second floor, which had tested positive for lead paint. When energy auditors from Conservation Consultants left the Talbott household in Homewood after two hours of testing for energy efficiency, mold, lead and radon, Mr. Talbott had a carbon monoxide detector in the basement, smoke detectors on each floor, and the promise of a safer and more habitable home in 2018. The Talbotts — Carl lives with his wife, a sister and a dog — are among 15 households in Homewood that CCI is testing with a grant from the Pennsylvania Housing Finance Agency. The service incorporates the programs that utility companies provide low-income customers. Most remediation work that is needed will be covered by the grant. Rebuilding Together Pittsburgh, another partner, will do some of the improvements. 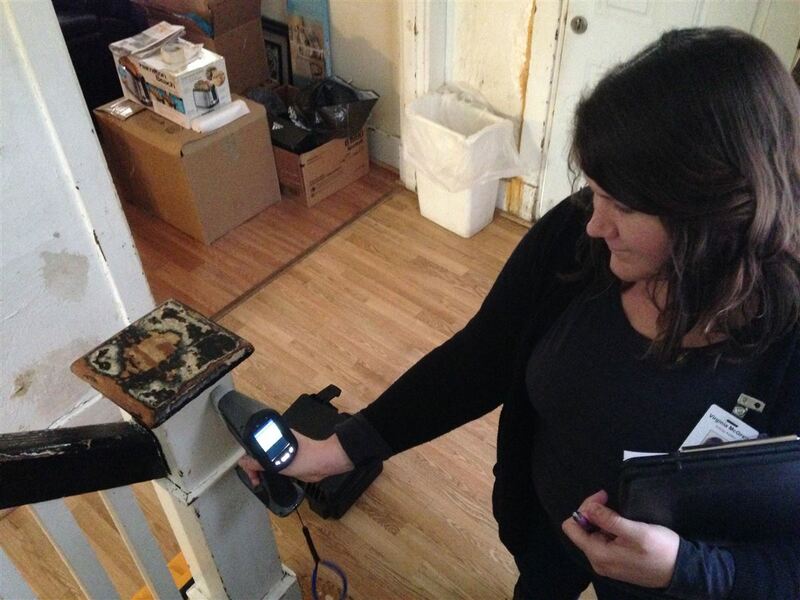 In the first round of the Grassroots Green Home campaign, CCI tested 20 households in Oakland and Uptown. The R.K. Mellon Foundation and GTECH supported that round. Alison Steele, CCI’s manager of community programs and advocacy, said the costs in Homewood, as in Uptown and Oakland, should be completely borne by grant funding and assistance programs. Mr. Talbott’s household was the first to be audited in Homewood. CCI has been doing energy audits in the region for years. For people who can afford it, such an audit costs $375. Lead testing is a separate service, starting at $275. That’s without lab samples. In-home testing, consultation and lab samples cost $405. The Grassroots Green Home effort is intended to make low-income households safer and to raise awareness about the dangers of lead, mold and radon. Radon — a radioactive gas released by the decay of uranium underground — can enter any home, and Allegheny County is a red zone for the existence of radon, according to the Environmental Protection Agency. Mold is caused by moisture coupled with poor ventilation and can cause asthma and lung infections. Lead paint was banned in 1978. Considering that most homes in Pittsburgh were built before then, lead is likely an undercoat in most of them. Undisturbed, it doesn’t pose harm, but lead paint dust can be dislodged during renovations or when paint is sanded from window sills, door frames and staircases. Lead paint dust is toxic if ingested. Lead pipes make water unsafe to drink. No amount of lead is safe for the developing brain, according to Ray Firth, retired policy specialist at the University of Pittsburgh’s Office of Child Development. Children exposed to lead paint dust are at risk of low birth weight, low IQ, attention deficit disorders and other neurocognitive damage that lead to learning problems, which can lead to school suspensions, juvenile delinquency and crime. The Centers for Disease Control and Prevention, the American Academy of Pediatrics and the Environmental Protection Agency all recognize that zero micrograms of lead per deciliter of blood is the only safe standard, but health and government agencies set various “action levels,” at 5, 10 or 15 micrograms. Mr. Firth, representatives from CCI and Women for a Healthy Environment have been lobbying public officials for better standards and policies, more funding for health inspections and better methods of enforcing procedures required of landlords. Lead paint removal isn’t necessary if it is buried under recent layers, but if it is flaking, chipping, peeling or disturbed enough to cause dust, it should be removed safely. “You automatically assume a building has lead,” said Jim Eichenlaub, executive director of the Builders Association of Metropolitan Pittsburgh. “Best practices were spelled out by the EPA. We have 25 to 30 classes a day of training” toward certification to do lead-safe work. He said responsible contractors follow the requirements of using plastic, wet vacs and other means to mitigate lead dust from blowing, and responsible landlords remove tenants during the work. The U.S. Department of Housing and Urban Development requires lead-safe procedures in public housing. Mr. Talbott said he was worried about lead in his home because his young grandson visits almost every weekend. Virginia McGrath, a certified lead inspector and CCI energy auditor, carried a lead detector device that looks vaguely like a science-fiction ray gun but with a blunt end she holds against painted surfaces. It measures concentrations of lead in milligrams per square centimeter. “Negative,” she said, stepping away from a blue-green painted door in the basement. On a staircase riser, she got a reading of 1.0. On the stair railing, she got a 2.3. In an upstairs bedroom, the window frame read 10.4. The higher the number, the higher the concentration of lead in the sample. The readings don’t mean that the paint you see has lead in it, she said. It could be a sub-layer. Tony Saccamango, CCI’s conservation services manager, used an infrared camera to detect insulation behind walls. There was none in the front. He spent most of the audit in the basement checking for gas leaks, carbon monoxide and drafts. A home energy audit looks like a group of people milling about with measuring tapes and devices that blink red and green, but the result of an audit can be dramatic. “If we address the basement and the attic, it changes everything” for the Talbott family, Mr. Saccamango said. A blower door test after weatherization will show how well leakage was plugged.